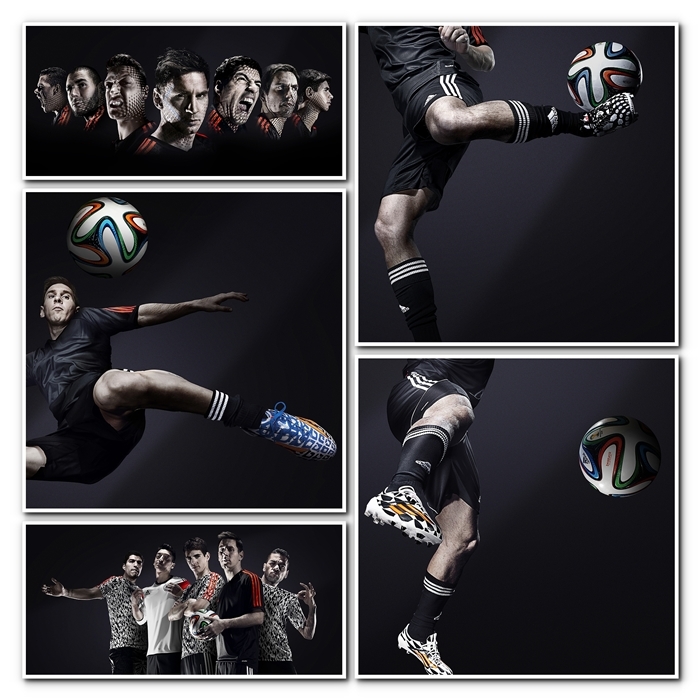 (SUKAN) ADIDAS’ GEARED UP AND READY FOR 2014 FIFA WORLD CUP™ WITH THE LAUNCH OF ‘BATTLE PACK’. 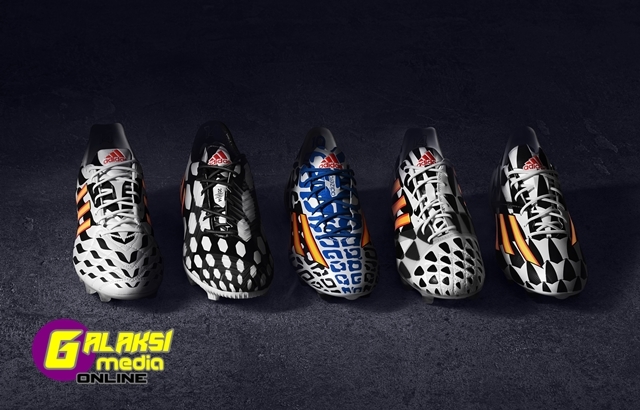 With just weeks away to the 2014 FIFA World Cup Brazil™, adidas Malaysia today launched ‘Battle Pack’ – the official footwear collection for the highly anticipated tournament. The adidas Battle Pack features a new boot from each of the five adidas boot ranges adizero™ f50, predator®, nitrocharge™, 11pro and adizero™ f50 Messi, each with its own disruptive black and white pattern to stand out on the pitch. Every boot has been designed with an aggressive identity and cutting edge technology. Debuting the collection at the launch were Malaysian football heroes S. Kunalan and Mohd Farizal Marlias of Selangor FA, Asraruddin Putra Omar from Johor Darul Takzim FC, Wan Zack Haikal of Kelantan FA and world-renowned freestyle footballer Nam The Man! Hosted by fitness personality Fay Hokulani and local host Hansen Lee, the event brought a taste of Brazil to Malaysian shores, with special Brazilian themed performances alongside a full display of official adidas 2014 FIFA World Cup Brazil™ merchandise, including team jerseys and an 8 foot giant Official Match Ball – Brazuca display. The adidas Battle Pack will be worn on-field during the FIFA World Cup™ by the full roster of adidas players including Leo Messi and Oscar to Dani Alves and Luis Suarez. The black and white colourway is a visual representation of the adidas “all in or nothing” 2014 FIFA World Cup Brazil™ campaign, with each boot exactly 50% white and 50% black. The only colour featuring on the boots is the fiery gold colours of the iconic three stripes of adidas, representing the ultimate reward of the FIFA World Cup trophy. The adizero™ f50 Messi is the only exception with an added blue and white colourway, inspired by the national colours of Leo Messi’s native Argentina. The black and white patterns of the boots have been inspired by the war paint of native warriors and the iconic pavement patterns of ancient Mesopotamia perfected on the Copacabana beach. The individual patterns are designed to express the attributes of each boot, as well as the attitude and abilities of the player type who wears them as they fight for victory – speed, bravery, control, energy and agility. The Battle Pack launch marks the next stage of the adidas “all in or nothing” 2014 FIFA World Cup Brazil™ campaign. The tournament is the world’s largest single-sport event and the ultimate platform for the adidas state-of-the-art footwear. The adizero™ f50 Messi combines revolutionary technologies with the precision engineering befitting of a four-time Ballon d’Or winner, with every aspect of the boot design based around making the wearer as fast as possible on the football field. At only 165g, the adizero™ f50 Messi is one of the lightest shoes on the market. The adizero™ f50 Messi has an additional blue added to the black and white colourway, inspired by the national colours of Leo Messi’s native Argentina. The adizero™ f50, worn by players such as Arjen Robben, Karim Benzema and Luis Suarez, is all about precision engineering with every aspect of the boot design based around making the wearer as fast as possible on the football field. With features such as SPEEDTRAXION, an all-new, high speed stud alignment for maximum acceleration and pinpoint changes of direction, and SPEEDFOIL, a revolutionary material that combines lightweight, softness and durability for a comfortable, yet locked down heel fit, the adizero™ f50 is a boot which ensures these world class players will be faster than ever before in Brazil. The boot is the only one of the Battle Pack to be designed with a white on black colourway (the others are all black on white) and is the latest in a line of new predator boots to be released especially for every FIFA World Cup since 1994. Favoured by the likes of Oscar, Mesut Özil and Fernando Torres, the boot is designed with five distinctive ‘Lethal Zones’ of technology to deliver outstanding ball control, touch, accuracy and power. The boot is made to master every aspect of performance. nitrocharge™, the energy-retaining football boot for the next generation of footballer as worn by Dani Alves and Javi Martinez, is designed for ‘The Engine’, the player who is always running, tackling and relentlessly powering his team. With its unique and highly elastic ENERGYSLING™ around the forefoot supporting sidecut and precision turn movements to sharpen reactions on the pitch, and ENERGYPULSE™ spring technology providing high energy push-offs and long lasting energy return when sprinting, the nitrocharge™ combines new technologies to innovate the way ‘Engines’ play the beautiful game. The 11pro worn by Philipp Lahm and Frank Lampard retains the classic attributes that allow players to control the game. With its highly innovative micro-fiber PU synthetic providing excellent fit, performance, comfort and ball-feel allied to an all new outsole with comfort frame for better pressure distribution, as well as optimised stud placement for maximum grip and acceleration, the 11pro remains the boot of choice for the complete footballer. The Battle Pack collection is now available for purchase at adidas own-retail outlets in Suria KLCC, Pavilion, The Gardens, Paradigm Mall and Empire Subang as well as specialist retailers and multi-brand sports shops nationwide. For further information please visit adidas.com/worldcup or go to facebook.com/adidas or follow @adidasfootball #allin or nothing on twitter to join the conversation.